Keeping an eye on your network. 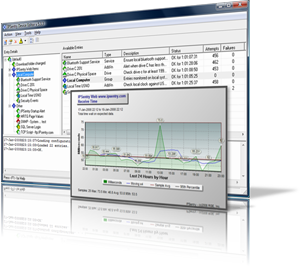 ipSentry is a Windows based network monitoring software package used by thousands of information system specialists, system administrators, and IT solution providers around the world. When you purchase ipSentry network monitoring software, you are buying a powerful network administration tool which will continuously monitor your internet and intranet servers, routers, modems, databases, services, event logs, and more, 24 hours per day; insuring that your network and devices are functioning properly. If a problem is detected, various alerts, notifications, and actions can be triggered to make sure you are aware of the problem as soon as possible. Like thousands of IT professionals around the world, use ipSentry to stay apprised of potential network issues and keep your network systems, servers, and other devices running smoothly. Download the fully functional 21-day evaluation of ipSentry Network Monitoring Suite and see for yourself why thousands of IT Professionals choose ipSentry to monitor their critical networks. You can purchase ipSentry on-line direct from RGE, Inc. through our on-line store and receive your license activation via email. You may also look at our current purchasing options and see how we can accommodate your purchasing requirements. Please feel free to contact us at sales@ipsentry.com if you have any questions regarding products, licensing, or other purchase requirements with which we can be of assistance. With ipSentry, you have the freedom to configure your monitoring system to be as simple or as complex as necessary for your environment. The buzzword is "scalability", we call it flexibility. With everything from simple ping response tests and web page monitoring to multi-component systems co-mingled with weighted value failure triggers and dependency based infrastructure monitoring, the complexity of your monitoring system is up to you - we just provide you with the tools. Browse the ipSentry feature set or take the brief ipSentry Tour.